Preheat the oven to 500°F, with a rack in the upper third. 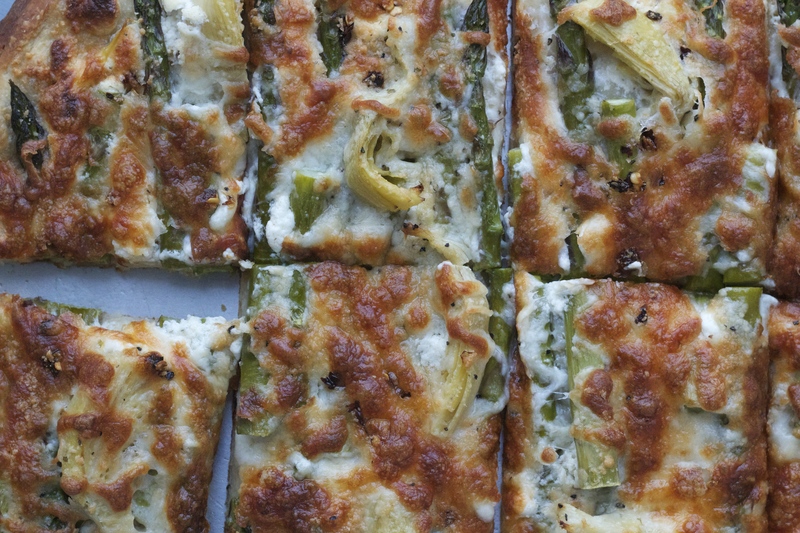 Drizzle a sheet pan with the olive oil and tilt to coat. Use your hands to gently stretch the pizza dough to cover the prepared sheet pan. If it shrinks a lot while you’re working with it and you can’t seem to get it to spread out, let it sit in the fridge for 5-10 minutes before resuming your pressing and stretching. It’ll get there. Spread the creamy cheese on the pressed out dough. 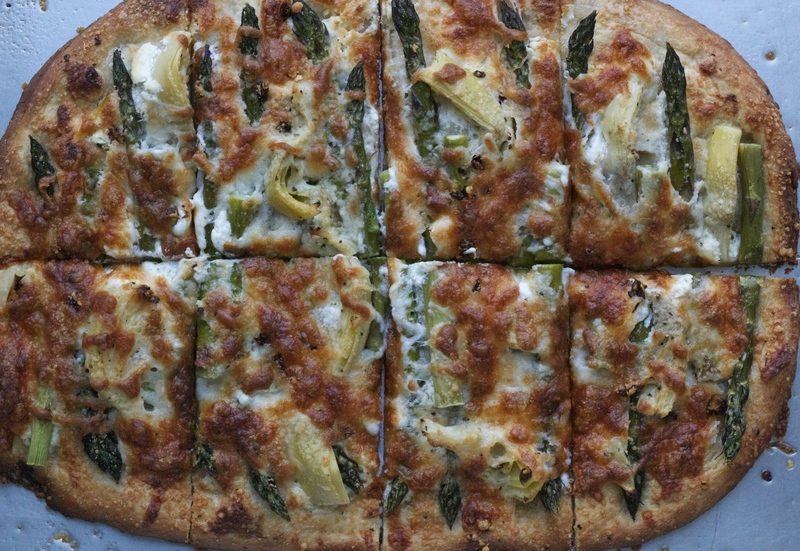 Arrange the asparagus evenly over the pizza, and dot with marinated artichokes. Generously sprinkle the mozzarella and Parmesan cheeses over the vegetables, and top with some salt and hot red pepper flakes, as you like. 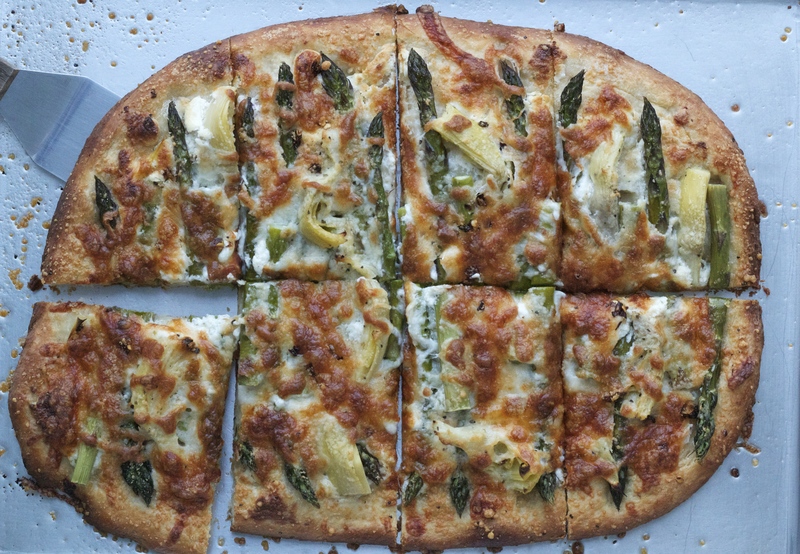 Bake the pizza for 18-20 minutes, or until the crust is deeply brown, the asparagus is tender, and the cheese is browned and bubbly. Allow the pie to cool slightly before slicing into squares and serving hot. Wow. That looks fantastic. It’s definitely going on the menu plan. Just made this pizza and ate my first piece…YUM!!! Wow! Love the creamy Boursin cheese flavor, the veggies, and the spice of the red pepper flakes. A perfect easy pizza to enjoy after a long day at work. What a treat! Made mine with whole wheat dough..tastes great and so good for me:) . Thanks for another great pizza recipe, Molly. Your apple, prosciutto and radicchio pizza is already a favorite of our family and friends. Hooray! So glad to hear. Thanks, Robin!